The learning curve’s been steep, steep and damp, so much for the start of the British summer, but we’re lovin’ it. We’ve carried each other through the 3am starts, the repeated drenchings, and hungover, post wedding dough balling marathons and are more determined than ever to push on and setup shop in Bristol. 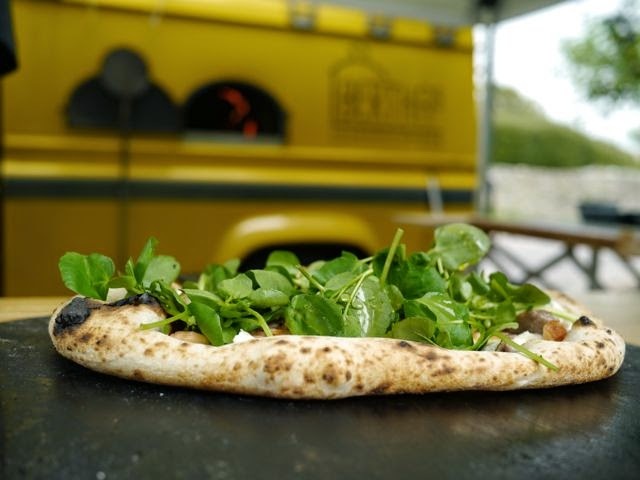 Our first events with the Arch Climbing Centre couldn’t have gone better, 150 pizzas sold and over £500 raised towards Meningitis Now, we were proud to contribute to the pot. 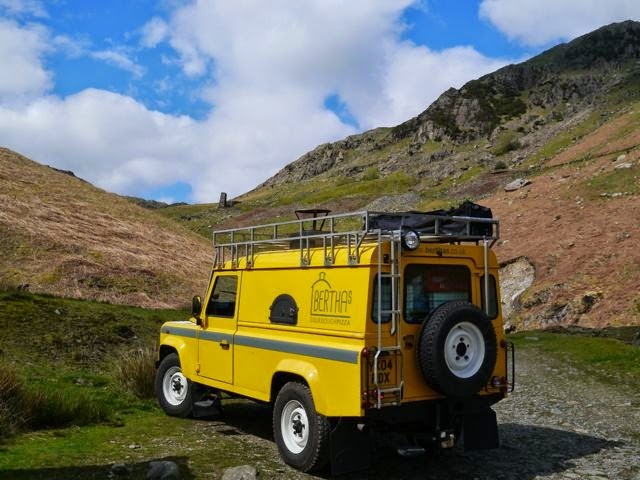 We trundled 300 miles up the country to the Lake District to serve pizzas at a wedding. 295 miles of jostling with lorries in the slow lane, 5 miles of bliss on a sheer gravel dirt track when the Landy came into it’s own. From there to Bristol. To finally serve our pizzas in Bristol. 150 pizzas done. We’d hoped to push the crowd, to steer them to something more unusual but our creamed wild nettle special was first to sell out and it seemed half the people we spoke to dabbled in their own foraging - respect Bristolians, we’re heading to the right place. After that we were rained on in both Wales and Dorset. At a private event in the Valleys - Rayfest - where the musical talents of the family kept us singing in the rain. Our ‘decent Dominos’ selection went down well and without wanting to sound like an M&S advert the pulled gammon and slow roasted pineapple with clove and allspice seemed to be well received. Then to Dorset, dough riding in the front, where the stresses of small village politics caused us to take up smoking. Our focus now is on moving to Bristol although the rental market there seems to have other plans, we lost out on two flats while driving down the M4 to view them and I’ll end my comments there before this turns into a rant. On a more positive note we’ve got our first St Mungo’s event on the 4th June when we’ll be catering for their volunteer celebration event, it’s quite a commute from London but we’re determined to launch this partnership and start collaborating with their centre. From July onwards we’ll start to become regulars at the Temple Quay markets which means we’ll have finally found a flat in Bristol or you’ll find us camping somewhere in the Mendips. For those outside the South West we’ve got a few other events confirmed around the country. On 20th and 21st June we’re teaming up with the Parlour Cafe for a 2 day residency in Burnham on Crouch. Coinciding with the longest day of the year we’ll be serving up sourdough, solstice slices - wittier puns or alliteration would be gratefully received at the address below. 3rd July is our Temple Quay debut before dashing up north the next day for the Grand Depart - Chris, Team Sky, if you’re listening, I promise to fast track your order if you cycle past for a take out. It turns out starting a business is a lot like lighting a fire, when the flames are roaring, when the idea’s established things get easier but we’re not there yet.